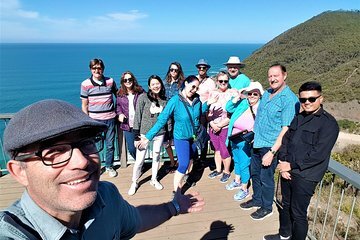 Ammira lo scenario della Great Ocean Road senza il fastidio della guida e della navigazione in questo tour per piccoli gruppi da Melbourne. Con solo 11 viaggiatori nel gruppo, sarai trattato con un'attenzione particolare da parte della guida e un'intima atmosfera di gruppo. Il tuo piccolo tour bus può fermarsi in alcuni dei luoghi fuori dai sentieri battuti a cui i mega tour bus non possono accedere, offrendoti più punti di vista ed esperienze. Le soste includono i passi di Gibson, i Dodici Apostoli, la vedetta di Teddys, una passeggiata guidata nella foresta pluviale, e altri, il tutto accompagnato da un autorevole commento guidato. Con una dimensione di gruppo limitata a soli 11 viaggiatori, questo tour promette un'attenzione particolare dalla tua guida. Great small group tour and our guide was excellent and with loads of knowledge and interesting facts. He made everyone feel at ease and welcome. Highly recommend this tour. Beautiful scenery and good stops along the way. I’ve travelled to over 50 countries and been to many organised tours. This was one of the best. Our guide was professional, friendly, patient and knowledgeable. He is full of energy and tries to crack a joke every now and then which we really appreciated. He was that fun-spirited, easy going, friendly bloke - the style that is well known around the world as the true Aussie. They are a young company that just started out in the business so not as many reviews as the big ones but the quality of the tour and professionalism was top notch. Thank you for an awesome tour experience. I hope your business continued success! We booked this tour based on the reviews and the fact that it was a small group tour and we were not disappointed!! Travis, our tour guide, was friendly and knowledgeable and had a great sense of humor! The small bus was a great benefit also since we were able to access areas the larger buses could not. This allowed us to access an area where we saw a Koala up in a tree along side the road. I also very much appreciated being only one of 11 guests rather than one of 24 or more, like the other companies along the route. Finally, when we stopped for lunch we were allowed to have lunch on our own at our expense. The other companies paid for lunch at the restaurant of their choice. This was great because there were many great restaurant choices available in the town of Apollo. At the end of the day, Travis provided dinner at a local pub/restaurant that had great home made meals. Very delicious indeed! The other tour companies dropped their guests off near the local fast food restaurants McDonalds anyone?, which would not have been a great way to end the day . . .
We highly recommend Melbourne Small Group Tours! If I could give it more than 5 stars, I would!